Candied pecans or walnuts are very popular in China. They can be served as appetizer, side dish or dessert. Most of time, they are also a great snack to go with coffee or tea. Some people prefer pecans, and a lot of people prefer walnuts. As for myself, I use more pecans then walnuts because pecans have a more delicate texture and flavor than walnuts. Bake the pecans / walnuts in the oven for 8 to 10 minutes. Please do remember to adjust the baking time accordingly because every toaster oven is different from one another. Pecans and walnuts are so easily to be over baked. Keep a close eye on them when baking. Remove from oven when they turn slightly golden brown. They will continue to cook even after being taken out the oven. Light or medium color brown sugar will be fine. Don’t use the dark brown sugar. Otherwise, the color would be too dark. While the pecans/ walnuts are baking in the oven, prepare the syrup. Heat a cast iron skillet over medium high heat. Add brown sugar and water. 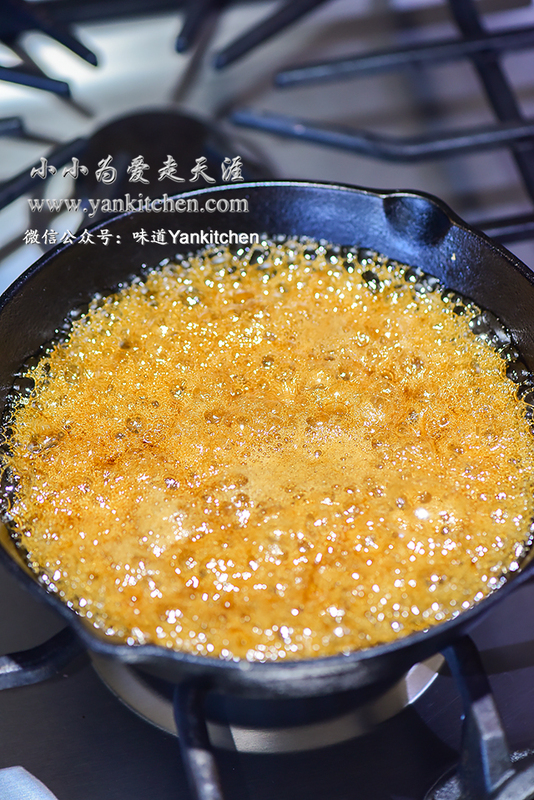 Brown sugar melts quickly and the syrup will very soon become bubbly. Keep cooking the syrup until it darkens a little bit. Bubbles get bigger too. There is a trick to test if the syrup is ready. Drop a couple drops of syrup into a cup of cold water. if it turns hard and firm, the syrup is done. If not, just keep cooking for a bit longer. Add toasted pecans/ walnuts into the syrup, along with some roasted white sesame seeds. With a spoon, gently toss everything together. Line up a plate or cast iron pan with parchment paper. Spoon the pecan / walnut mixtures onto the parchment paper. Spread them as evenly as possible. You have to do it very fast and quickly, because the candy syrup will begin to harden once removed from heat. Wait for the candied pecans/ walnuts to completely cool down to room temperature. They will be super crunchy and tasty.